I thought the flower pot and the flower would break and only one pot and flower would appear. A single pot appeared but two flowers appeared when i broke the block under the pot with a blue orchid in it. I've only tested with that flower. So i don't know if it's just that one. 1. Put a block down. 2. Put a flower pot on top of the block with a blue orchid in it. 4. You'll get the block, a single flower pot and two flowers. MC-31374 Flower pot duplicate items if you break the half slab under that. 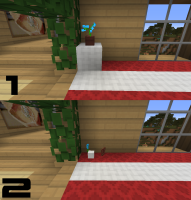 MC-32189 Item in flowerpot duplication when destroy block under it. MC-34322 Breaking block underneath flower pot duplicates contained item. MC-41027 Plants getting duplicated if been put into plant pot and block under is broken instead of plant pot. MC-41716 Plants / Flowers duplicate.